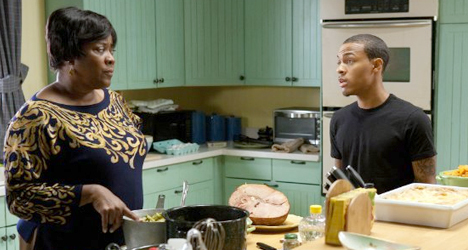 Kevin (Bow Wow) and his grandma (Loretta Devine) react to winning the lotto in "Lottery Ticket." As an urban-centric summer offering, “Lottery Ticket” begins with a handful of surprisingly solid laughs before quickly backpedaling into a second-rate mainstream comedy reminiscent of others produced by Ice Cube like “Barbershop” and “Beauty Shop.” Sure, things could’ve come out a lot worse (“First Friday” comes to mind), but the humorous setup can’t compete with a first-time director and screenwriter who can’t quite execute the more insightful issues they hoped to highlight. Rap artist Bow Wow – in his fifth major film release – stars as Kevin Carson, a young Footlocker employee who dreams to one day move out of his neighborhood and own his own shoe company. When Kevin reluctantly buys a lottery ticket and finds out the following day that he has hit the $370-million jackpot, he, his grandmother (Loretta Devine), and his best friend Benny (Brandon T. Jackson) aren’t the only ones jumping for joy. When news hits the streets about Kevin’s good fortune, the entire neighborhood comes looking for him and wants to share in his newfound wealth. With the lottery ticket office closed for the Fourth of July, Kevin has to get through the weekend without doing anything to jeopardize the tiny paper ticket in his pocket. Instead of doing what most sane people would do (leaving town and holding up in a hotel for a few days or even going to the bank and putting the ticket in a safety deposit box), screenwriter Abdul Williams leaves Kevin out to fend for himself against his riotous neighbors, a kingpin (Keith David) who befriends him after his win, and the local ex-con bad boy (Gbenga Akinnagbe) who also wants to cash in big. Ice Cube takes a smaller role as Mr. Washington, a mysterious old man and former boxer who hangs out in his basement and never leaves his home. He takes kindly to Kevin who doesn’t mind running small errands for the elderly recluse. 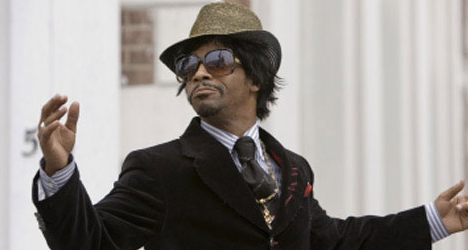 Although he acts as the voice of reason, Cube dressed in old man makeup is about as funny as Tyler Perry in a muumuu. Aside from the authentic friendship between Kevin and Benny, which leads to the more dramatic moments of the film, “Lottery Ticket” begins to drown as it attempts to sidestep some of its earlier faults. When Benny preaches to Kevin that he needs to make a difference in his community with the money he’s won, the message feels hypocritical when you think back to the point in the film where Benny goes on a selfish little shopping spree. “Lottery Ticket” could be a vehicle for a some escapism (who hasn’t thought about what they would do if they got so lucky? ), but the shoddy blend of social commentary and stereotypical humor doesn’t make for much of a trip anywhere.